On September 12, the United States imposed a new round of sanctions against Russia prohibiting U.S. companies from exporting goods, services, or technology to Russian defense and energy companies. Last year, the U.S. exported over $400 million worth of oilfield equipment to Russia. Consequently, the new round of sanctions has greatly affected the oil and gas compliance industry, including suspending a $20 billion joint venture between Exxon and Rosneft, Russia’s state-controlled oil company. Your daily commute isn’t the only thing that oil has been fueling as of late. 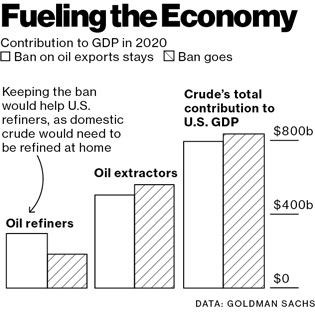 The U.S. oil industry is in the midst of an ongoing debate whether to lift a 1975 ban on the exportation of crude oil. This four-decade-old ban on U.S. crude oil exports was imposed by Congress in response to the 1973 Arab embargo and a dwindling of domestic oil reserves. Since then, new technologies have enabled U.S. oil production to top 8 million barrels a day, the highest since 1988. In fact, the U.S. is now the world’s largest producer of crude oil. The US will soon begin exporting “fracked” liquefied natural gas (LNG) abroad. Fracking, a technique used to extract oil, has put the country in a position to become a major gas exporter. The Energy Department has recently approved the first LNG export proposal and is now in the process of reviewing 20 others. Many companies have already started preparing to export LNG. A $20 billion project to prepare an export terminal for LNG is currently underway in Louisiana. The terminal was originally designed to import natural gas, but is instead becoming an export terminal due to US gas becoming abundant and relatively cheap. 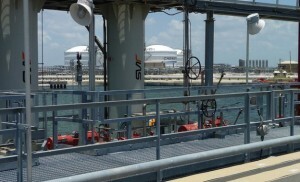 Another terminal in Texas that was originally constructed to import gas has been investing in systems to liquefy gas ready for export. Once completed, the terminal is expected to export nearly 20 million tons of LNG a year. With rising global energy demand, the oil and gas industry faces a wide range of logistics challenges. Energy companies also have significant risks related to compliance from both an increasing volume of regulations and the complexity of product classification. 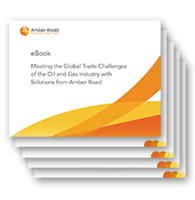 Join World Trade 100 and Amber Road (formerly Management Dynamics, Inc.) on Thursday December 15th at 2 PM EST for a complimentary webinar, Global Trade Compliance in the Oil & Gas Industry: A Case Study with Weatherford.